Are you looking for some Christmas gift ideas for your toddler or preschooler this holiday season? With SO many options available, it is hard to decide which toy would provide your child with the MOST enjoyment as well as keep your child engaged and actively learning. We have found some popular toys for this holiday season that are both FUN and educational for toddlers and preschoolers that we think your kids will LOVE. These toys are suitable for both boys and girls. On this page, you find a selection of toys that introduce young ones to different colors, letters, numbers, shapes and more. Some of these toys also introduce children to stacking and building with wooden blocks to make different structures. There are also toys that introduce kiddos to different musical instruments. Read the reviews below to help you decide which toy you think your child would LOVE best for Christmas. The Hape Country Critters Play Cube is designed with different animal friends and five sides of play. 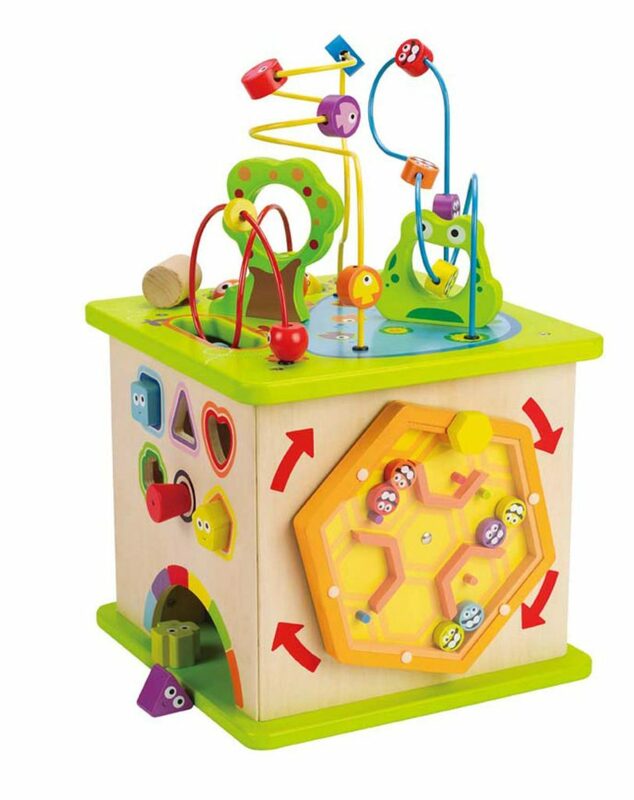 Your toddler will never grow board with this toy as it has many activities including a shape sorting puzzle, a ball roller coaster, rotating maze and a tracking panel, all topped with a brightly-colored, unique floating wire maze. These cute little shapes and animals are adorably painted with large, animated eyes that are sure to delight your toddler and keep them entertained for hours. 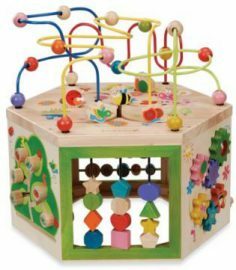 This activity cube is an animal inspired play cube that includes ten pieces featuring wooden balls, shapes, wooden pounder, and more. This learning puzzle toy will encourage motor skill development, logic skills and perseverance in toddlers. This toy is made from solid wood, is durable and has child safe paint finishes. Your toddler will have hours of fun with the many activities that this toy has to offer. This toy will help nurture their imaginations and encourage storytelling as it is such an interactive toy. This learning toy is suitable for children from 12 months up to 6 years. Watch this video above to learn more about this activity play cube. The Fisher Price Classic Teaching Clock makes learning to tell time FUN for kids. 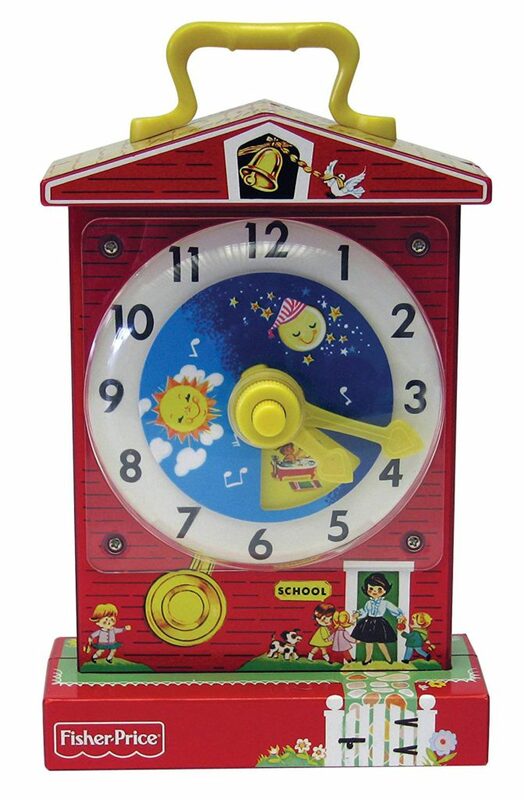 This retro click is designed as a little red school house and has a rotating dial with timeless pictures of preschoolers hour by hour, as the clock face and minute hand revolve to the soothing ticking of time! When you wind it up it up, the Fisher-Price Classic Music Box Teaching Clock plays a song called ‘Grandfather’s Clock and has a rotating dial with timeless pictures of preschoolers hour by hour, as the clock face and minute hand revolve to the soothing ticking of time! Original Toy Kids Children City Blocks feature 75 wooden blocks that are natural, painted & printed by hand. This block set comes with a retail packaged cardboard barrel with carrying handle. This toy is suitable for ages 2 years plus for both boys and girls. Parents and grandparents agree that these blocks are VERY colorful and your toddler will enjoy stacking and building different structures with them. They are also great for sorting according to various shapes and colors. Another toy that is a lot of FUN for toddlers and preschoolers to play with are these cute bowling pins. The Melissa & Doug K’s Kids Bowling Friends Play Set features a 7-piece soft-plastic bowling set which includes a 4-inch indented ball and six character pins for toddlers and preschoolers to play with. These friendly character pins include two puppy dogs, two bears, a cat, and a giraffe that are brightly colored and easy for small hands to grasp and lift. The light ball has contrasting colors and indents like a real bowling ball to make gripping easier. This set is made from soft, squeezable plastic with different textures and would be perfect for indoor or outdoor use. There are many ways that toddlers and preschoolers can play with this bowling pin set. In addition to setting the pins up and knocking them down, they can be used to tell stories and play other imaginative games. This set comes in a durable carrying case that lets you bring the fun wherever you go. 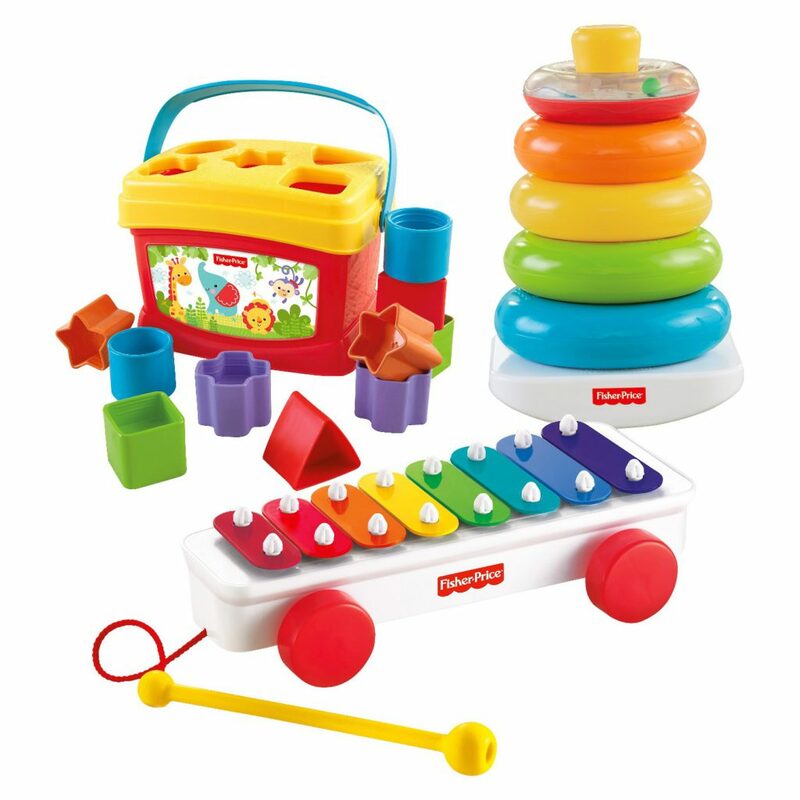 This Infant Trio Gift set features a Rock-a-Stack with five colorful rings to sort & stack. Learning to stack the rings from the biggest to the smallest teaches children the concept of different sizes. This set also features Babys First Blocks with 10 colorful blocks to sort, stack & drop. These blocks offer put & take play, as well as stacking, sorting and matching to help baby develop problem-solving skills. Grasping and sorting also helps baby develop finger & hand dexterity while placing blocks through the correct shape and then taking them out again. Also helps baby to strengthen eye-hand coordination. This set also features a FUN Classic Xylophone that has string & wheels for pull-along fun, encouraging walkers to take and make music wherever they go! Tapping the keys encourages fine motor skill development and eye-hand coordination. This Fisher-Price Classic Infant set introduces children to music creative thinking, shapes and colors, large motor skills and memory skills. The recommended age for this gift set is 18 months and up. The Fisher Price Laugh & Learn Smart Stages Sis is a soft, cuddly and lovable pup for small children. This cuddly friend can grow with your little one from birth to toddler-hood. Introduces children to 75+ songs, sounds, tunes & phrases! This toys introduces children to different body parts, colors, letters, numbers, and more. It encourages thinking skills in baby as he or she finds their own ears, tummy and heart. Sis comes with Smart Stages technology, so you can choose the level that’s best for your child. As your little one discovers that their touch makes Sis speak and sing, they see that their actions can make fun things happen (aka cause and effect)! 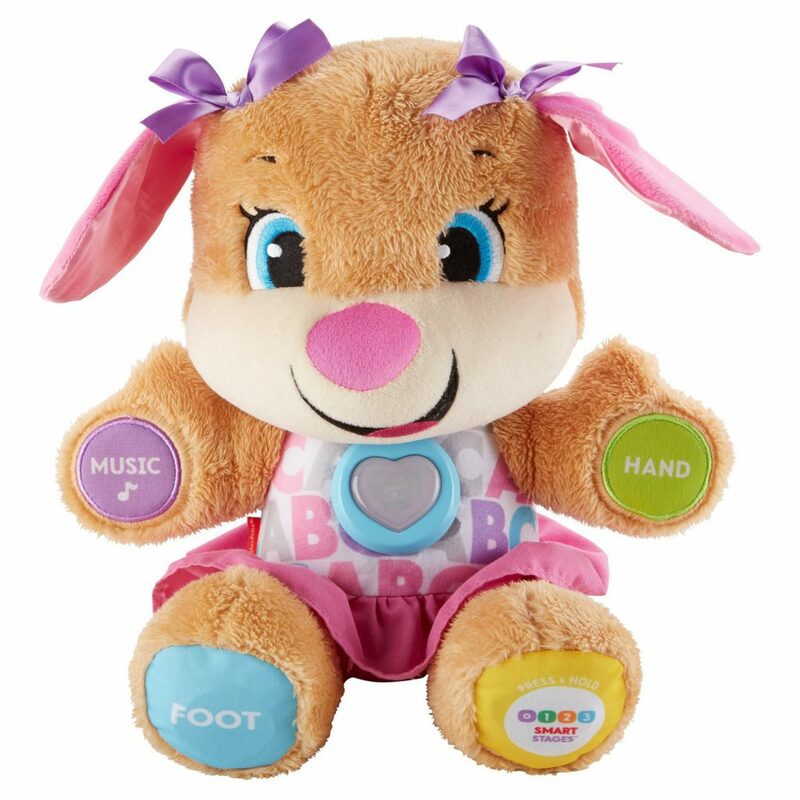 Sis teaches over 100 first words and says over 75 songs, sounds and phrases in a FUN and simple way simply by pressing a paw or ear. The buttons on the hand and feet are also easy for small hands to press which is an added bonus. This toy is suitable for ages 6 to 36 months. Another toy that is a favorite with toddlers to play with is Fisher-Price’s Little People Noah’s Ark. The Fisher-Price Little People Noah’s Ark is another toy by Fisher-Price that will keep toddlers busy for hours with imaginative play. 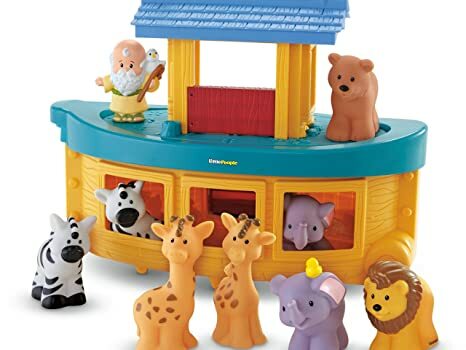 This two-piece ark includes Noah and eight animal friends: two elephants, two lions, two zebras and two giraffes to mix, match, sort and count! It’s a perfect way to help your toddler or preschooler discover and recreate the classic story of Noah’s Ark or just have fun matching up the animals! The “Deck” is removable for additional nurturing play and easily snaps back on for storage. 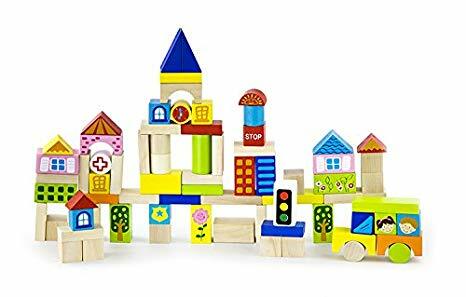 These building blocks for toddlers includes 32 colorfully patterned wooden blocks that are painted with a non toxic finish making them safe for kids. 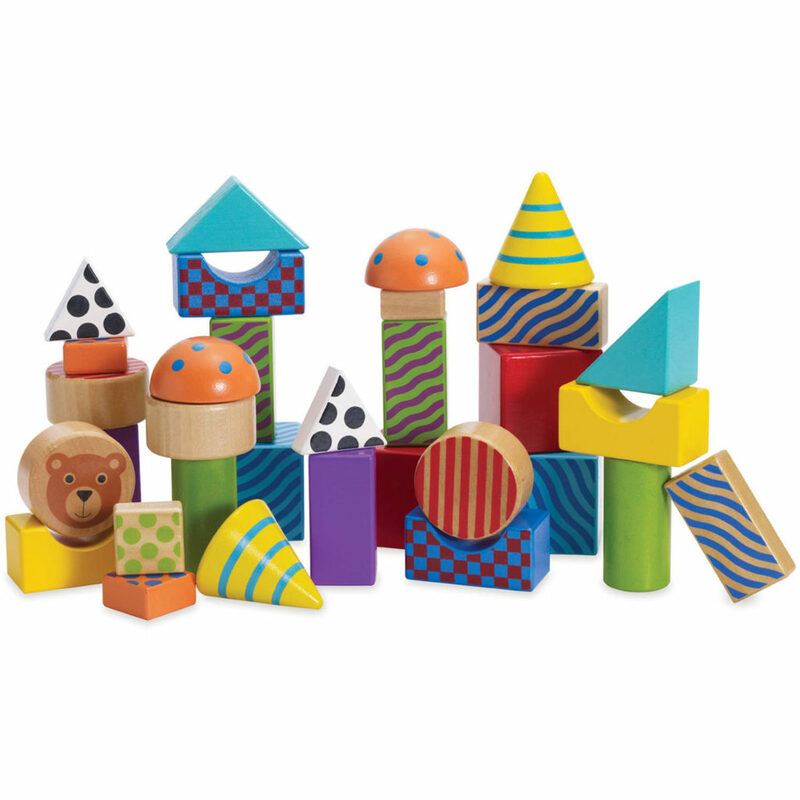 This FUN set features a variety of shapes and sizes that can be stacked in an unlimited number of ways. This is a great way to encourage interactive open-ended play by allowing children to build and be creative with the many pieces in this pattern block set. This set also encourages the development of fine motor skills in toddlers. These blocks are made from 100% wood and can be hand washed. They feature a colorful, non-toxic water based finish so they are SAFE for your child to play with. Let your child build and create with the Manhattan Toy Create & Play Pattern Blocks. Here is a toy that is a BIG HIT with preschoolers. 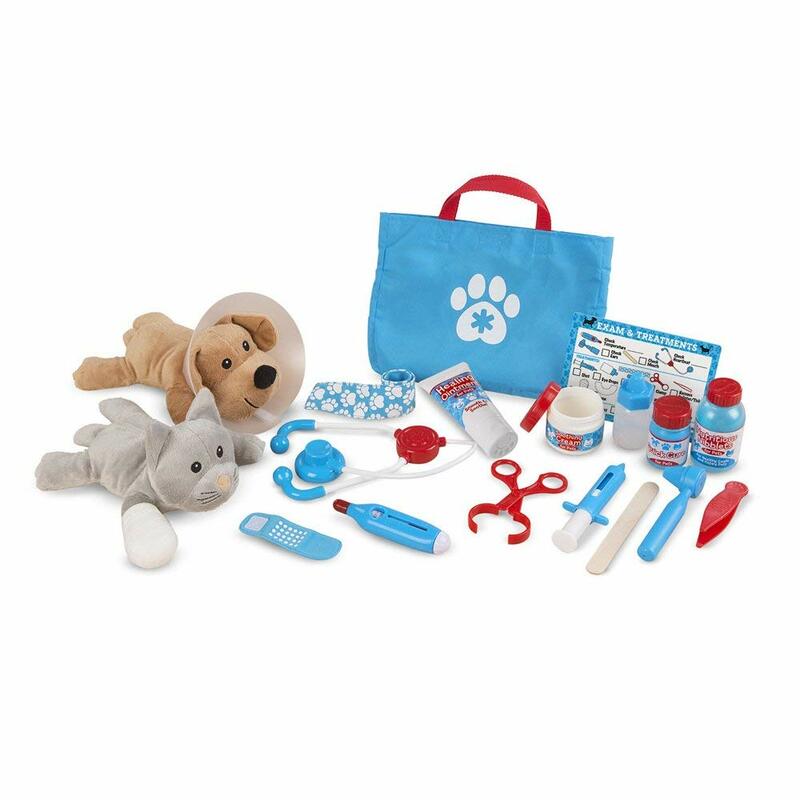 This Vet Play set features a 24-piece pretend play set with a plush dog and cat and fun veterinarian role playing accessories. The accessories include stethoscope, thermometer, syringe, ear scope, tweezers, clamp, cast, bandages, ” treatments,” “ointments,” and reusable double-sided checklist for office visits. If your child is an animal lover then this Treat Pet Vet Play set will encourage imaginative and creative play for hours of FUN. This toy is intended for preschoolers or children 3 years plus. This portable wooden barn opens wide for easy play access and closes up to take with you when you are going to Grandma’s house. 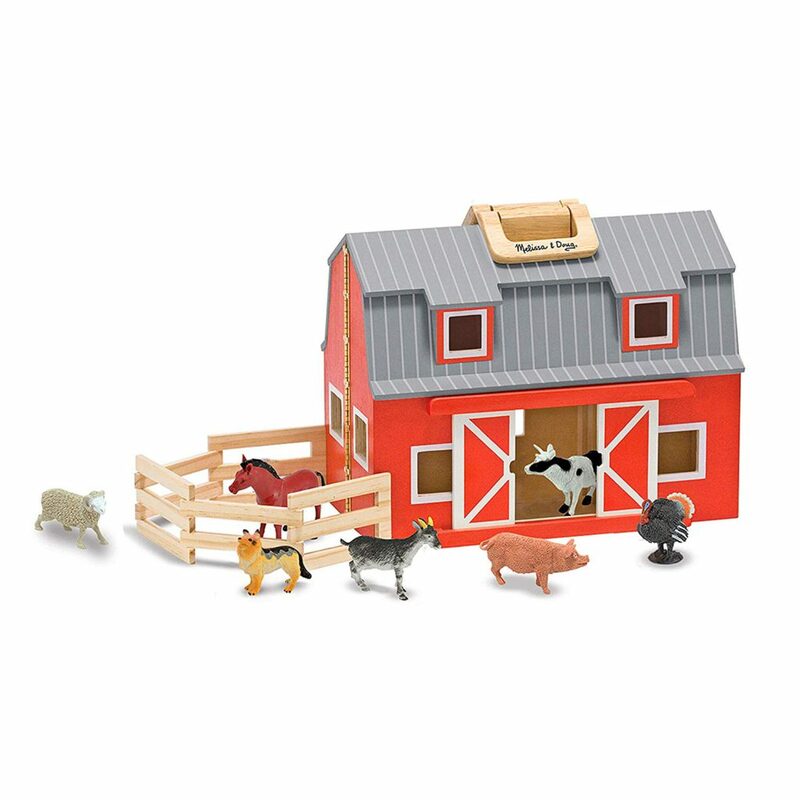 This wooden barn features a chunky handle for easy carrying and includes seven realistic plastic farm animals, a wooden ladder and a folding corral. It also has sliding doors to let the animals in and out and separate stalls for the animals to get cozy. This barn is made of sturdy wooden construction and promotes imaginative play, story telling and fine motor skills in toddlers and preschoolers. Another gift idea that is sure to be a BIG hit with toddlers and preschoolers is a balance scooter bike. The Mint Balance Scooter Bike by Janod is modeled after a retro motor scooter, and is great for teaching small children how to balance and steer long before they graduate to a big kids’ bike. Balance bikes teaches young children how to balance and coordinate without having to worry about peddling. This wooden bike is very durable and the seat is adjustable to accommodate your child as he or she grows. Balance bikes eliminate the need for training wheels down the road as children learn how to balance and gain confidence with time. There are LOTS of ways to play and learn with this versatile Sorting Garages & Cars’ learning set! The seven graduated garages (all decorated with objects to count and colors to match) can be arranged to make a colorful town, or stacked to make a tower tall with learning opportunities. Then nest them for neat and easy storage! Each garage matches one of seven stackable cars by size, color and number, opening up endless opportunities for stacking, counting, hide-and-seek, mix-and-match and imaginative play. This set comes with seven numbered garages and seven numbered cars. This toy is recommended for children ages 2 years and up.